This story of Lieutenant Ralph. D. Doughty MC. military service, along with extracts that are taken from his five diaries. It tells the life and death of a New Zealand gunner who had served in the AIF during WWI, and during this time had written five day-by-day diaries (on active service) between the 5 April 1915 to the 16 March 1917, and from the campaigns – Gallipoli, France (Western Front) and Belgium (Passchendaele). Submitted by Peter Kivell. 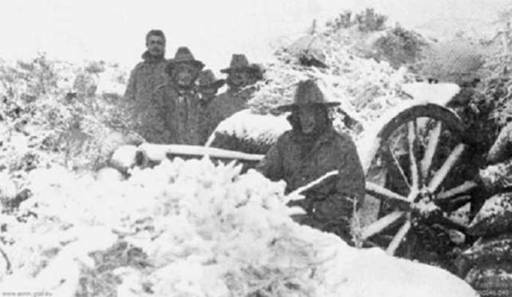 After receiving their ‘Full Marching Orders’ to go ashore at Gaba Tepe on the 26 April, 1915 members of the 2nd Battery, 1st Field, Artillery Brigade could not have known what lay ahead for them on such an arid and inhospitable Gallipoli peninsula. But, by reading the diaries of one artilleryman, ‘who had spent nearly eight months on the peninsula’ we can gain an understanding from this account of the campaign as seen through his eyes, with every aspect of military life entered into his diaries. Being towed ashore aboard overloaded punts, young ANZAC troops ‘men that had never before experienced enemy fire’ were greeted by a hail of bullets and artillery fire sent from Turkish troops that were stationed in well fortified trenches and forts. This was Ralph Doughty first experience of being under fire and the beginning of nearly three years of service for the Australian Imperial Force. Ralph’s skill as an artilleryman was kindled back in his native New Zealand, enlisting with the NZFA service. Having completed his training Ralph was to spend five years with 'H' Battery, after which he left at the completion of his service. 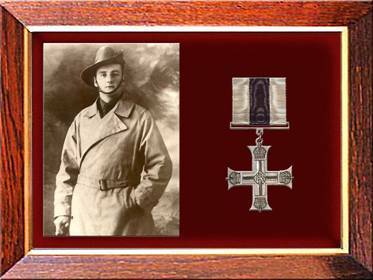 Ralph’s war time service began when he re-enlisted on 24 August 1914 at the age of 23. At this time he was in Australia looking for work, so it was with the AIF, 1st Field, Artillery Brigade, that Ralph enlisted. Diary four, a hard covered field service correspondence book, was started on 22 March in Tel-el Kebir. Ralph added entries of his voyage over from Egypt aboard the SS ‘Tunisican’ during which he was placed in charge of two battery horses: ‘Both my charges are doing A1. Phyllis recognises me every time I pass her, but Beauty is still dubious. Phyllis is a most expensive lady. Costs me a small fortune for lumps of sugar’. The transport arrived at Marseilles, France, on 29 March and after a short rest the battery crew travelled via train to the town of Le Harve. From there it was on to the war zone of the Western Front where Ralph was to experience his first hate against the 'Hun': ‘24 April 1916 (Easter Monday), This afternoon we had our first "hate". Stuck in about a dozen rounds for luck. Our anti-aircraft guns brought down a Taube today. Sunday artillery duels the order of the day otherwise quiet. Its just 12 months back when we were all anxiously waiting for our first scrap, and here now after one year of scrapping we are considered quite veteran soldiers.’ Ralph was to continue writing daily entries around many areas of the Western Front, with his last entry added to diary four on 11 August while in action around the areas of Le Val de Maison and Pozieres: ‘Getting straight most of the day. Enjoying this spell immensely. Chas, Richardson and myself went for a glorious ride this evening. Great to be able to cruise around the country without having to dodge shells and craters. But no sooner had Ralph arrived to enjoy his rest than he was ordered to return to Belgium, retracing the route back across the channel to arrive at Poperinge and directly back into battery duties on 5 October. Ralph continued his battery duties up until 16 March when he was to place his last entries into his set of five diaries, with a very appropriate ending for an artilleryman who had given his all since enlisting back in Sydney in 1914: ‘15th March 1917, Working like a Trojan getting things square. Mud still gloriously soupy and still raining. 16th March 1917, Better day today. Very heavy bombardment on both left, right and centre. Between Ralph’s last entry in diary five until he was wounded in action on 23 July 1917 ‘or nearly 3 months of artillery duties’ no more diaries or information could be found on his artillery service. Information on the wound Lieutenant Ralph. D. Doughty received on 23 July 1917 at Coxyde Bains, Belgium, up until his death 3 days later has been sent over to me from Australia on the 13/11/2011 by the son of Lt Kingsmill. Extracted from the memoir of Lt Ken. S. Kingsmill. 20-23 July 1917, I went over to the control pit to see if any news had been received as to what was going on and, as I came round one side, Lieutenant Doughty came round the other and we met at the entrance to the pit. He put his hand behind me and said ‘‘‘Go on, hop in ‘Kingie’’’, which I did. He fell in behind me. A premature from one of the 12th Brigade guns just behind us had sent a splinter in his back and out his stomach. We got a stretcher, cut down the gas curtain, and sent him off to the dressing station. He was a fine man and a very well-liked Officer. On 23 July, Had news that Doughty was doing well. 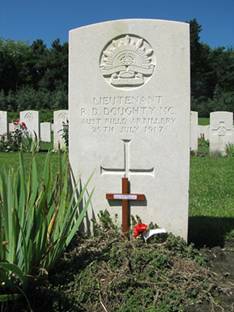 Got to bed at 4.30 a.m. on 25 July and up again at 9 a.m. Rainy and dull all day and we got word that Doughty had died at the 15th Corps Dressing Station. 7 August 1917, Rode into Bray Dunes again on 7 August, then on to Coxyde Military Cemetery where I planted a small wooden cross on Lieutenant Doughty’s grave and got back to wagon lines at 10.45 p.m.
All of Ralph’s diaries made it back to New Zealand intact from ‘bloody conflicts’ through numerous campaigns and have now been carefully transcribed into a readable format with care and respect by many individual people. This had to be done before the entries were lost forever, being that it has been over 94 years since Ralph last placed pencil to paper in diary one. Ralph Doughty, my great, great uncle, will forever be remembered by my family and his diaries are being looked after with care by myself.
' Honoured and never forgotten by his family in New Zealand '. This photo shown below was taken on the 27th November 1915 and was sent to me by the family of Sidney James. Sidney was a ‘pal’ of Lt Ralph Doughty MC who had both served on the Gallipoli peninsular. But (apart from what ‘Sid’ had written on the back of the photo), no names where mentioned. So unfortunately we are unable to tell if Ralph Doughty is in the image. Maybe, maybe not, but I assume he is, but where ‘I do not know’. ‘With everyone frozen in time at 12 below’. Ralph’s diary entries on those days mentioned on the photo. Slightly warmer today, although plenty of room for improvement. Round at A69 all day. Saw some of the Turkish Batteries trying to get some of the destroyers and trawlers, also an aeroplane or two, also got introduced to a sniper who nearly scored 2 hits I know about. Our gully got shelled in it's turn at Dinner time. Saw most amusing incident but can't put it down here. Visited a 4.7 on the right flank later. Raining. Raining and quite cold enough for snow. Along at A69 all day. Sea very rough and things looking very black in general. Horribly short rationed with food and water. Too rough for boats to get close enough in for the use of lighters. Can't expect our guns to arrive in this weather. Bunk at 5.30. Snowing hard. Started last night at 11 pm and still snowing 6 pm. Cold as Charity with a 30 m.p.h. wind whisking the spindrift about. Lovely sight from my dug out. Everything is perfectly white. But gee, isn't it hot. This afternoon got issued with McIntosh's warm underclothing. Don't half need them either. Managed to pinch some Quaker Oats and had porridge for supper. Wrote Linda. Bunk 9 pm.